Ray Bellamy was a 3 sport star at Lincoln Memorial High School in Palmetto, Florida, earning letters in football, basketball and track; he served as captain of the football team and Student Body President, as well as the Florida State Student Council president, a theme that would follow him to Miami. He was named an All American and All State in football. 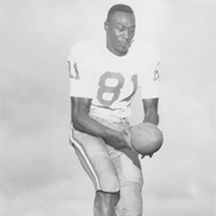 UM President Henry King Stanford thought it was time to break the color barrier on the football team, the school having integrated its students in 1962, and Ray was the first African American athlete given a scholarship to Miami. He chose the Canes over Florida, Florida State, Nebraska and Indiana, among other schools. After setting records in 1967 on the freshman team, Coach Charlie Tate utilized Ray’s talents the following year for the varsity as he caught 37 passes for 549 yards and 2 touchdowns. His best game came at Auburn, where he gathered in 8 passes for 121 yards. He also caught a 78 yard touchdown pass for Miami’s only score against #4 Penn State, at the time, tied for the third longest pass reception in school history. The following year, he would catch 8 passes for 163 yards and a 66 yard touchdown reception against Wake Forest. Ray was severely injured in a near-fatal car crash in January ,1970, that cut short his promising career. At the end of his playing days, he was in the top 8 in career catches and yards on receptions, most yards and catches in a season, and most total catches in a game. His 37 receptions in 1968 was a UM Sophomore record. In 1971, Ray was voted Miami’s first African American Student Body President. A member of Iron Arrow, he was named to Who’s Who in American Colleges and Universities. He credits his mentor, former university President Henry King Stanford, for teaching him to deal with his situation at Miami, and in relating to people of all walks in life. Bellamy graduated with a degree in Education in 1971, Business Management in 1972, and also has a Masters in College Student Personnel. He has 3 children, Rhonda, Aaron and Byron and currently works as an academic advisor/instructor at Florida A & M University in Tallahassee.